She hit the red carpet with one outfit and showed off a second later in the evening — but they were the same dress. Black-ish’s Yara Shahidi had a quick change during the 50th NAACP Image Awards in Hollywood on Saturday night. The 19-year-old Grown-ish star transformed her busy dress into a sleek sequined outfit. The 5ft3in actress and model showed off an avant-garde look at the beginning of the evening. Her short black dress was decorated with an enormous folded white fan in front. The structure nearly obscured her face and seemed to be held on by a strap of material around her midriff. Later, Yara ditched the fan to spotlight the LBD in its full glory. The glittering outfit featured some padded shoulders that seemed to increase her stature, which was also aided by her black heels. Freed of the extra dressing, her toned legs took center stage. The Smallfoot actress’ tightly-curled hair framed her winning smile and a delicate pair of pearl earrings. Yara was nominated for Outstanding Actress in a Comedy Series for her leading role in Grown-ish. The series is a spin-off of Black-ish. She plays Zoey Johnson, the oldest daughter of an upper-middle class black family. Her current series, which premiered in 2018, follows Zoey as she begins college and has to contend with the adult world. 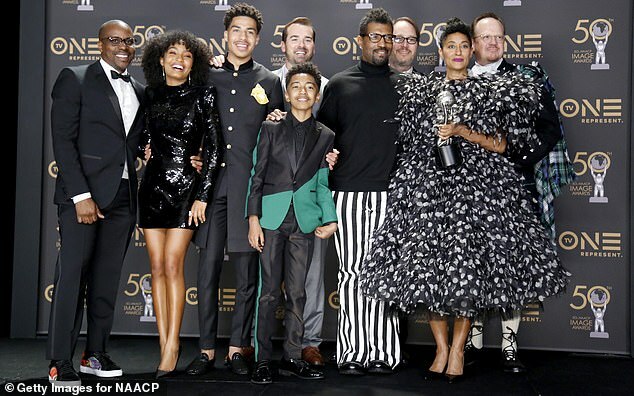 The original series also stars Anthony Anderson, who hosted Saturday night’s award ceremony, as well as Tracee Ellis Ross. Tracee, who plays Zoey’s mother, Rainbow, was also nominated for the Outstanding Actress trophy against Yara. The Girlfriends star notched another win, her ninth. Luckily, there didn’t seem to be any bad blood between the co-stars.